Whom is a fair target for political criticism? Each time Temasek Review or other netizens expose the identity of a civil servant or grassroots leader convicted or formally accused of some crime or misdemeanor who’s not a PAP MP or political acolyte we observe two different reactions from readers. There’s the crowd which blames the ruling party for not doing enough to check a person’s background and the media for not reporting his ties with the government, and alternatively there’s the crowd who says it’s not fair to blame the PAP for the wrong-doings of someone who’s not even in office or planning to run for one. Take for instance this recent expose by Temasek Review, when Lianhe Zaobao initially reported on how an unnamed married man had left his pregnant mistress on Hong Kong and cheated on her. Subsequent investigations by netizens and reporting by the Temasek Review revealed that man was none other than Mr Raymond Teoh Tham Kim, who currently holds a Chairman post in the Toa Payoh East Division, a grassroots organisation. Some people argue that this shouldn’t be political fodder since he isn’t an MP and certainly has no plans to run for office. This would be a convincing argument if Singapore had a governmental structure where the ruling party, grassroots organisations and the civil service are all kept separate. It does not. In his outspoken way, Lee admitted that all grassroots organisations (with nearly 30,000 community workers) which interact and organise activities in the estates were actually part of his party. It is used by the PAP to foster bonds with Singaporeans. Since they are publicly-funded and overseen by the People’s Association, a government statutory board under the Ministry of Community Development, the community workers are supposed to be non-partisans. “… Everywhere they (the Chinese) go, they see the PAP – in the RCs (residents’ committees), CCCs (citizens’ consultative committees), and the CCs (community clubs),” Lee beamed. In Singapore, MPs also have an important role in running town councils. As provided for in the Town Councils Act, this role includes managing the common property of HDB estates and carrying out local improvement projects, thereby contributing to the well-being of the people of the constituency. The roles of MP and adviser are distinct and separate, even though government MPs, wearing their other hat of advisers, are expected to perform both roles. Opposition MPs cannot be appointed advisers, because they do not answer to the ruling party. They have no constitutional or legal obligation to carry out national programmes on the Government’s behalf. Nor can the Government hold them to account if they perform this role unsatisfactorily. Let me re-emphasise that the LUP is not a town council programme. It is a national programme which receives most of its funding from the Government. Of course the above answer simply begs the question of why isn’t the Lift Upgrading Programme made a Town Council Programme? Is it because otherwise the ruling PAP party would not be able to deny opposition-held wards funds for the programme or exercise political control over it? 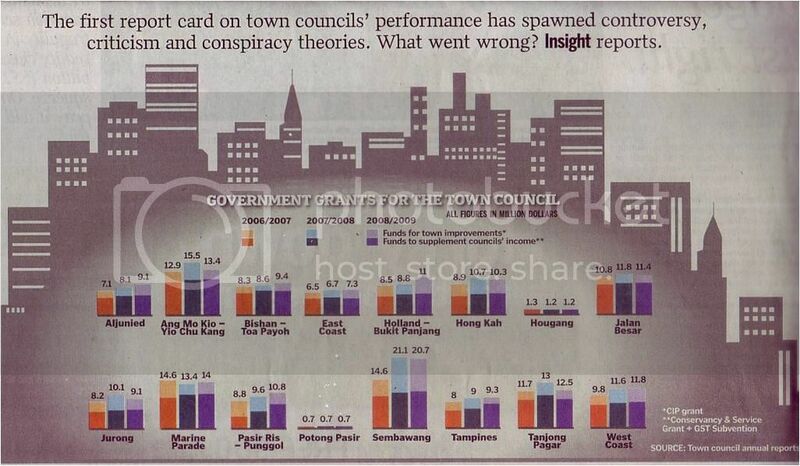 Add to this the fact that Opposition-run town councils often receive far less funds from the government than PAP-managed ones, which gives the ruling party power to punish voters who vote against them and reward those who remain loyal. One can hardly be left with the impression that many of the grassroots organisations, which should remain non-partisan, seldom hew to the neutral line. As for the civil service, who can forget that it was a former high-ranking civil servant, Accountant General Chua Kim Yeow who was tapped by the PAP as a reluctant opponent to Cabinet minister Ong Teng Cheong in Singapore’s first presidential election in 1993? Your query of 27 Feb 2011 refers. Civil servants may volunteer to serve in grassroots organisations as these provide opportunities to contribute to the community as well as understand ground issues. The Public Service Division is not in a position to comment on media speculation about potential political involvement. What can one make of this reply? It’s obvious that the PSD has refused to rule out possible political involvement in the upcoming elections in any possible manner. The most prominent of these groups was the civil service, whose senior members merged with and to a large degree even supplanted the political leadership. In Singapore, civil servants have long played a key role in the political process. Lee Kuan Yew exhorted them: “Your role as civil servants is not only to help the Government well, but to help the Government in carrying the bulk of the people along with it.” The civil service must therefore do more than work with the government: it must help mobilize popular support and build a consensus in favour of government policies. As the ruling elite co-opted the civil service, so the civil service in turn became politicized to serve the ruling elite. As noted earlier, the two were naturally inclined to share the same values, and a close identification of interests developed between them … The alliance, based on a convergence of interests between an increasingly technocratic civil service and the political leadership, has played a vital role in conferring legitimacy on the government. The ruling party and their apologists should not cry foul for being unfairly blamed for misdeeds and crimes of appointed civil servants and grassroots leaders if they do nothing to dispel the impression that grassroots organisations and the civil service are often called upon to serve barely concealed political ends. Political accusations of misconduct of grassroots leaders and civil servants are fair game in the political arena if they refuse to demarcate between the civil service, grassroots organisations on one hand and the ruling party on the other. Previous Topic: Singapore Income Inequality – a bigger picture? Next Topic: Financial Issues Top Cause of Our Divorces? Hmmm, I guess most of us did not know so many hidden issues. thanks to this published article, now we are seeing the unseen.